The trip was done with a Toyota Land Cruiser 4x4. It was the second car on the trip, the first one had died in Mali. This one got me without further problems to Dakar. After traveling through Burkina Faso and Mali, I crossed into Senegal near Nayé. From there we drove north to Matam for the first overnight stop in Senegal. 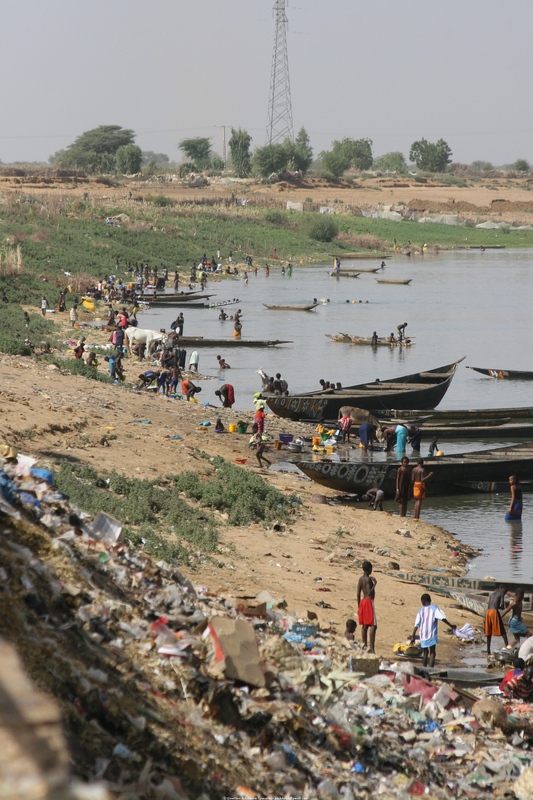 Matam is a sleepy little town, not far from the Senegal River and the border to Mauritania. 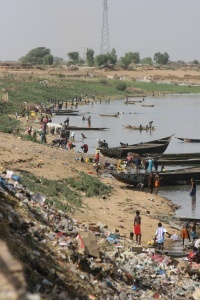 We visited a village on the Senegal River, which is the border between Senegal and Mauritania in that area. The next day we continued north, then west to Saint Louis. On the way to Saint Louis we passed through a UN refugee camp. It seemed well organized from what I could see just driving through. Saint Louis is a city full of French colonial reminders. It is in three parts: On the mainland, on the Île de N'Dar, and the Langue de Barbarie Peninsula. It is a very scenic city. In Saint Louis we had problems with traffic police. They stopped us twice for trumped up traffic violations. The first time we had to drive into town, pay a fine, then drive back to where they had stopped us to retrieve our papers. The second time we were luckier. One of the policemen wanted to get to a place about 15 km (9 miles) in the direction that we were going. In exchange for giving him a ride, they let us go without paying the fine. From Saint Louis I visited the Parc National des Oiseaux du Djoudj, a fantastic bird sanctuary (see Senegal Nature) about 60 km (37 miles) north of the city. After the bird sanctuary visit, we continued south to Dakar. This was the worst traffic that I have seen in a long time. 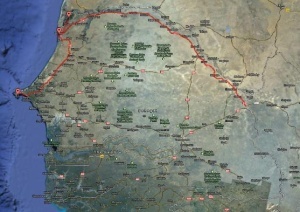 There is only one road going into the peninsula on which Dakar is located. The traffic on this road is a mess. I was supposed to stay in Dakar for two nights and have a tour of Dakar, the Île Goré. That is when my trip started to fall apart. The tour organizer, Balanzan Tours stopped sending money to my guide. My guide ran out of money, so I had to pay for the hotel myself, and didn't get to see the city. From here I was supposed to go on to The Gambia for a short visit. At that time my guide was completely out of money, so they didn't drive me to The Gambia, I had to stay in Dakar till my return flight. Of the three countries that I visited on this trip through West Africa, I liked the people in Senegal the least. There was a distinct gradient in the propensity of people to smile from Burkina Faso to Mali to Senegal. A similar gradient was in the pressure from hawkers. There was much less pressure from hawkers in Burkina Faso than in Mali, on the other hand, in Senegal it was even worse than in Mali. The hawkers were everywhere, and if not hawkers, there were kids begging. People in general didn't like it when I wanted to take pictures, so I didn't get as many pictures of people as I would have liked. The hotels in Saint Louis and Dakar were very good. The hotel in Matam was average, but clean. The food was pretty good. It was quite expensive in Saint Louis and Dakar. The local beer is a fairly good lager, just what I like in a beer. In Saint Louis and especially Dakar it was quite expensive. Outside of the main cities, people live in small villages, some are the usual mud brick and straw huts, but many have more substantial buildings. Senegal is clearly much more affluent than Mali. The official language in Senegal is French. I didn't get much information about the situation with different tribes in Senegal. I assume it is not as fragmented as in Mali. Many women wear traditional ankle length dresses, but a larger proportion wears western style clothes than in Mali. Men's clothing was more western style t-shirts and pants than traditional clothes. One thing that had to do with clothes was baffling me till I was in Saint Louis. When women work with things on the ground, they bend down from the waist, not squat down in the knees. I somehow always had an odd feeling about that, it just didn't seem right. I finally realized why when I saw a teenager in a mini skirt in Saint Louis. I am a cross-dresser, and a while ago I started wearing mini skirts myself. I very quickly learned the lesson how to pick something up from the floor while wearing a mini skirt. You do not bend down from the waist, as I saw the women in West Africa do, when you wear a mini skirt, unless you want do flash the people behind you. I had learned that embarrassing lesson so well, that it made me uncomfortable even to see other women bend down like that. However, women in West Africa almost exclusively wear ankle length dresses, so they can afford to bend down from the waist. The most common food crops are millet and sorghum. My visit was during the dry season, so the fields were fallow. After the harvest, the millet and sorghum are thrashed. The millet straw is collected and stored in piles to dry. The straw is later used as building material in the small villages. Like in other parts of Africa, the markets are an important part of society. In the larger towns, the markets are daily, in the smaller villages they may be only once or twice per week. I visited markets in Saint Louis and in and around Dakar. It was quite interesting to walk through these markets and watch the people. Everything is for sale that you may need. The most important part is usually the food market, other parts are for other household goods. Senegal seems to have more wildlife sanctuaries than Mali. I visited one bird sanctuary, the Parc National des Oiseaux du Djoudj, a fantastic bird sanctuary (see Senegal Nature. I saw lots of birds, large monitor lizards, crocodiles, monkeys and warthogs. Senegal is much better off than Mali, but because of that of course it is more expensive as well. The nature reserves seem to be worth visiting, certainly the one that I visited was great. This bird sanctuary certainly was the highlight of my visit to Senegal.